Kranthi malayalam movie to be directed by debutant Lenin Balakrishnan featuring Sunny Wayne and Bhama in lead will start rolling very soon. The movie which tells a music tale is weaved with matter of social concern. Sanju Sivaram, Sreelakshmi Sreekumar, Kavya, actors Amit, Manu and Anwar will give life to other prominent characters in the movie. Kranthi is produced by Dr.Sajan K George under the banner Vibgyor Cinema. The camera is being handled by Sreejith Vijayan. Sunny Wayne, who made his big screen debut with 'Second Show' is gearing up to make his strong presence in the film industry. Waiting for the release of upcoming movie 'Sarathy' and 'Double Barrel', the young actor has signed two projects. Other than Praveen Prabharam's 'Villain', Sunny will play the lead in 'Kranthi' helmed by debutant Lenin Balakrishan. Touted as a music entertainer, the movie is weaved with matter of social concern. Sanju Sivaram, Sreelakshmy Sreekumar, Kavya, actors Amit, Manu and Anwar will give life to other prominent characters in the movie. Expected to start rolling from the last week of December, the movie will be shot mostly in Thrissur. Sunny Wayne and Sreelakshmi play music enthusiasts working together to put up a band. Bhamaa's character will be the suspense element in the story. 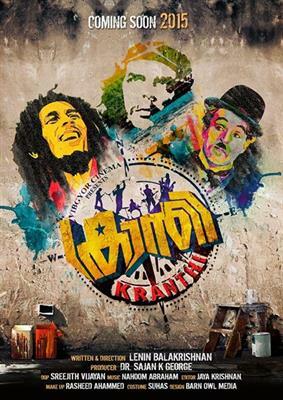 Kranthi is produced by Dr.Sajan K George Vibgyor Cinema. The camera is being handled by Sreejith Vijayan. For the lyrics of Jayakrishan, the music is set by Nahoom Abraham. More than being a music delight, the makers plan to make the theme more interesting adding matters truly connected with the social life. The movie is proposed to release as a summer treat in 2015. Sunny was spotted in a never seen avatar in Lijo Palliserry's big budget movie 'Double Barrel' jointly produced by August Cinema India Pvt Ltd and Amen Movie Monastery. Set in the backdrops of Goa, this action comedy movie will feature very unusual automobiles settings while the actors would be seen in Brazilian style make-ups totally different and vivacious from head to toe. Meanwhile Sreelakshmi Sreekumar is getting back to back projects. Her recent release 'Odum Raja Adum Rani' received positive responses from the spectators. Her upcoming release will be 'Once Upon There was A Kallan'. 'Kranthi' will also open doors for the youngsters keeping high passion over movies.